An unmanned aerial vehicle (UAV), commonly known as a drone, is an aircraft without a human pilot aboard. UAVs are a component of an unmanned aircraft system (UAS); which include a UAV, a ground-based controller, and a system of communications between the two. The global military UAV market is dominated by companies based in the United States and Israel. 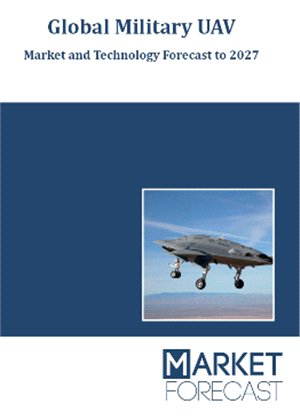 The report “Global Military UAV - Market and Technology Forecast to 2027” examines, analyzes, and predicts the evolution of military UAV technologies, markets, and outlays (expenditures) over the next 8 years – 2019 -2027 in the defense Industry. It also examines military UAV markets geographically, focusing on the top 95% of global markets, in the United States, Europe, and Asia. Throughout the report we show how military UAV Tech is used today to add real value. To provide the most thorough and realistic forecast, this report provides a twin-scenario analysis, including “steady state”, emergence of new military UAV tech in the Security industry. Trend Analysis : Key Defense Markets: Analysis of the key markets in each region, providing an analysis of the various Systems segments expected to be in demand in each region.